In this week’s installment of The Wheelhouse, we will be looking at the hitting portion of the baseball skills shoot. In the hitting section, we use three different cameras to provide three different angles of the athletes swing. The first two of these cameras are used in profile, mainly to capture the hitter’s form. This helps us accent the hitter specifically so coaches can see their load as the ball comes in, their steady balance at the point of contact through their swing, and a hitter’s finish. We are looking to capture the best of the fundamental and technical side of the swing here. Coaches at any level past high school will tell you they look for players who have good form, who are sound fundamentally, and are able to control their swing through the zone. The first camera captures the hitter in real speed. 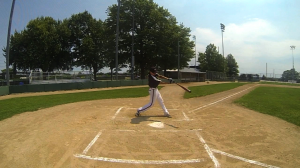 The second camera shoots the hitter’s form and swing in super-slow motion. Using two cameras at this angle allow us to best capture the hitter’s talents. The form and technique of a player’s batting stance are very important to capture in the skills shoot. But we make sure not to forget about bat control, bat speed, and how these two connect to where the baseball travels. This is where camera three comes in. Located behind the batter, this camera angle is able to capture the pitch coming to the plate, the batter’s reaction to the pitch, the batter’s full swing through the zone, and the direction of the baseball after contact. It is important to show the baseball off the bat going past the batter’s box so that coaches can actually see the direction of the ball. This helps to show whether the athlete can hit to all fields and how they handle inside and outside pitches. It also helps show whether it is a ball hit very well to the outfield, a line drive through the infield, or a solid hit groundball for a base hit. After the footage from all 3 cameras are captured…All Star’s producers come in and edit the hitting portion of the baseball recruiting video together to show our recruit’s best hitting qualities. College coaches are then able to evaluate each recruit with the best aspects of their swing shown in relation to form, fundamentals, technique, balance, bat speed and bat control.